I recently participated in a panel discussion at the National Sheriffs' Association annual conference in Nashville on the topic of ICE's Secure Communities (SC) program and immigrant community safety and trust. The latest statistics on SC were presented, followed by remarks from me and sheriffs from three diverse counties in Texas, Minnesota, and North Carolina, all of whom voiced skepticism of the idea that immigration law enforcement has a "chilling effect" on immigrants' trust of local police, adding the weight of their decades of experience to my own research findings that this widely repeated criticism is baseless. 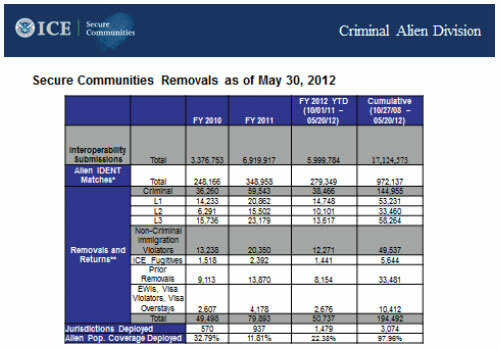 Gary Mead, of ICE's Enforcement and Removal Operations, provided the latest statistics on who is being identified and removed as a result of the Secure Communities (SC) program. Under SC, the fingerprints of everyone arrested are screened against DHS databases as part of the routine criminal background check. From the program's launch in October 2008 through May 2012, ICE has identified about 970,000 criminal aliens and removed 194,000 of them. The majority of these are convicted criminals, although ICE also removes those found through arrest who have been deported before, skipped out of immigration hearings, or are simply here illegally. The deportation of the latter group, "mere" first-time immigration violators, who represent five percent of the removal caseload, has drawn sharp protest from anti-enforcement advocates, and caused them to characterize the program as a sweeping dragnet that ensnares many law-abiding and harmless immigrants. As a result, ICE management has made an extraordinary effort to see that officers in the field avoid these cases (though few others seem particularly troubled by their removal). My remarks focused on what is known about crime reporting by immigrants and how law enforcement agencies should address concerns that immigrants will no longer report crimes if local police and sheriffs cooperate with ICE through SC and other programs. According to government data, there are no significant differences in crime reporting across ethnic groups. The few localities that have kept track (including Prince William County, Va., and Collier County, Fla.) have found that their partnerships with ICE have not reduced immigrant crime reporting. Finally, academic research indicates that if immigrants don't report crimes, it is most likely due to language barriers, cultural differences, or distrust of authorities in general, not because they fear deportation. So agencies that want to build trust in immigrant communities should address those issues, not refrain from cooperating with ICE. Sheriff Adrian Garcia of Harris County, Texas, which includes Houston and is one of the nation's largest counties, described their layered approach to identifying criminal aliens, which relies on both Secure Communities and the 287(g) program. He said that they have submitted more than 500,000 fingerprints of arrestees for screening through SC, with a "hit" rate of 10 percent who have a DHS record of some kind. Of those, 30 percent have been removed by ICE. But because SC can identify only those illegal aliens who have a DHS record, Harris County also depends greatly on its trained 287(g) deputies. In Harris County, because of its proximity to the border, there are many illegal aliens committing crimes who are not in DHS databases, often because they are recent arrivals. Without 287(g), says Garcia, ICE and Secure Communities would miss about half of the criminal aliens. With respect to concerns from immigrant advocacy groups on community trust, he expressed his hope that ICE would start "carrying its own water" in explaining the value of these programs, rather than leaving local agencies to deal with this on their own. Sheriff Rich Stanek of Hennepin County, which includes Minneapolis and one-fifth of the population of Minnesota, said that the implementation of Secure Communities was helpful, but did not require a big change in operations because local officers in Minnesota "have been asking inmates about their citizenship since about 1852" (apparently without ever being sued by the Department of Justice or the ACLU). This year, as a result of the implementation of SC, ICE has issued about 46 percent more detainers in his jails (from 308 last year to 449 this year). He said that the universal fingerprint screening of SC was more effective than having ICE agents interview inmates Monday through Friday. This is because before SC many inmates were able to escape ICE attention simply by lying about their citizenship — but the fingerprint checks prevent that. Sam Page, the Sheriff of Rockingham County, North Carolina, near Greensboro, described the reasons why Secure Communities has been welcomed by law enforcement agencies in his state, which include serious drug trafficking activity connected to Mexican drug cartels (for more on this see our October panel discussion featuring a group of sheriffs) and problems with reckless, drunk, and often unlicensed illegal alien drivers. ICE has picked up 60 percent of the non-citizens who have been booked into his jail since SC was activated, and 50 percent of them were traffic offenders. About one in six of the offenders identified under SC are illegal aliens who come back after having been deported before, demonstrating once again that our border is far from secure. Sheriff Page also described his extensive initiatives to make sure that the Latino communities in his jurisdiction understand the reasons for his active cooperation with ICE. In addition to frequent interviews with Spanish language media outlets, Sheriff Page also has utilized his existing faith community jail ministry programs to forge connections with pastors, priests, and other leaders who help him communicate with immigrants and others to explain his activities and how they help protect law-abiding residents of the county. His outreach included a meeting with the Mexican consul, who tried (in vain) to persuade him to endorse "comprehensive immigration reform" and acceptance of the notorious consular identification cards. Sheriff Page's experience, which is not unique, but should become a model for many others, demonstrates that it is definitely feasible to have productive and mutually reinforcing partnerships with ICE and immigrant communities, contrary to the claims of enforcement opponents. If immigrant advocacy groups truly wish to help maintain secure communities for those they claim to represent, they, too, should start helping forge such relationships instead of focusing their efforts on obstructing immigration law enforcement in all its forms.